Mini Kirsten is much different from her two sisters. She was the second mini to join the AGDC world. She is very mischievous and gets into trouble. She never bothers to brush her wild hair, and Mini Julie has to work it into braids-IF Kirsten lets her. A Big Kirsten would act much different from this little troublemaker, Madeline says. Like most Nellies, Mini Nellie is an adorable little dolly with a big heart. She’s caring and soft-hearted, and loves to play. She is the newest mini doll. I love their middle names!Its so cute! Julie Albright, and Molly McIntire. (Hey, we both have Molly! You also have Mini Julie! Sweet!) Can you comment back on advice and just talk to me? Do it quick! Whatever you do, don’t do it in spring or summer because my family got a pass to go to Darin Lake sometime then. Thanks! Love, Emily L., Emily B., Rebecca R., Julie A., and Molly M.
Thank you for taking interest in my website! I feel blessed that I inspired you to do your own thing. Can I e-mail you some advice and information of how to do what I do? That would be great! Your doll collection seems really cool and I’d love to see them in photo stories and things. Thank you a lot! I don’t have my own Email adress, my mom has hers, and I don’t think she would like it if “a stranger” took over the emails. I know you, but my mom doesn’t. You know, I used to randomly find this site a lot when I was younger, but I wasn’t even into AGs! I didn’t have any. And, until last year, I didn’t have much dolls. Just my doll, Emily. THANKS FOR REPLYING! I think they are blue or brown. Let me check and I’ll get back to you! has nellie ever been in a photo story?bye maddie!!! Hey again, Madeline! I think you should make a photostory on just the mini dolls! I like your website! It has a lot of good photo-stories! Hey Maddie if u check out the Ag site they have special addition mini dolls!! plus a few other NON AG doll things!!!! by the way Maddie I love your site!!!!!!!!!!!!!!!! I know it’s 5 months early to talk about this Maddie,but I saw one of your photo stories,about Christmas,(I’m always early for Christmas)And I was planning on buying a bunch of presents and a mini Christmas tree for my AG dolls Felicity and Bree. Since this blog was for Mini Dolls,I want to ask you which mini doll I should get my AG dolls.I need 3 mini dolls since i’m buying a bitty baby for named Zoey.I want to get a mini doll for all 3 of them. PERFECT!Thanks so much Maddie!Great idea!That is perfect for them since my brother is probably getting me Julie soon,Bree luvs Samantha,and Lissie has always wanted herself.He!He!And i’m sure Zoey would love getting Molly!Or I could buy 2 Julies.1 for Julie,and1 for Zoey to play with.Thanks for the advice!Did you get my e-cards? P.S.-What does a JLY doll mean? Your welcome for the ecards.After all,we ARE friends!Thats what friends do,send things!I hope I recieve ecard(s) from you!You don’t have to though:)I really like you being my friend!And thanks for the meaning of JLY doll! :)Did you subscribe to the american girl Magizine?I’m going to subscribe it for my other friend Lizzy(Liz)who was talking to me on-Contact me! (Plus other locations)Sorry!She loves to chat with me!I told her to go to writing wall but she didn’t.It’s alittle emberessing! :( well,I’m subscribing for her Christmas Present,and wondered if you wanted it.Actually,I don’t know your address for them to send it to you.But if you don’t get the magizines,We could find a way for them to get it to you.PS-Do I have to have an email or a google or yahoo acount in order to email you?Because my mom said I can’t have an account.And I know your email address.I saw your utube vidios!Cute voice to Maddie!Your so creative! And how do you do the smily faces? 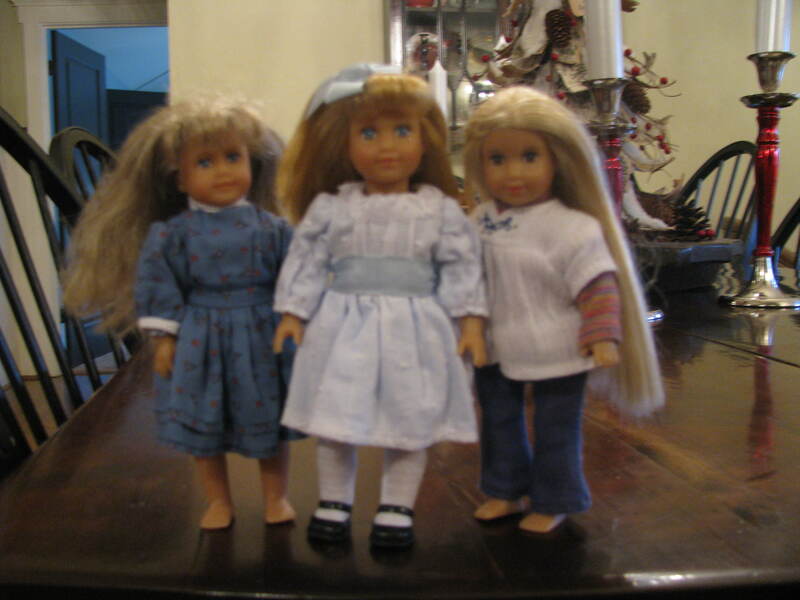 hi i’m in england but love the american girl dolls i have one small one and two big ones. They are Kirsten as my small one and Samantha and Nellie as my big ones. In england we have made our own chinsa dolls called ‘a girl for all time’ it would be great if any of you guys had a look at them.